The definitive history of American postwar liberalism, told through the lens of those who brought it to life. Liberalism stands proudly at the center of American politics and culture. Driven by passion for social justice, tempered by respect for the difficulty of change, liberals have struggled to end economic inequality, racial discrimination, and political repression. Liberals have fueled their cause with the promise of American life and visions of national greatness, seeking to transform the White House; the halls of Congress, the courts, the worlds of entertainment, law, media, and the course of public opinion. Bestselling author, journalist, and historian Eric Alterman, together with historian Kevin Mattson, traces the history of liberal ideals through the lives and struggles of fascinating personalities. "The Cause" tells the remarkable story of politicians, intellectuals, visionaries, activists, and public personalities battling for the heart and soul of the nation. 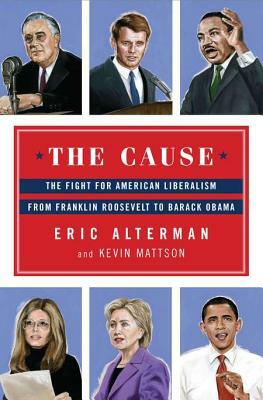 The first full-scale treatment of postwar liberalism, "The Cause" offers an epic saga driven by stories of grand aspirations, principled ambitions, tragic flaws, and the ironies of history of the people who fought for America to live up to the highest ideals of its history. Eric Alterman is Distinguished Professor of English and Journalism at Brooklyn College and the CUNY Graduate School of Journalism. A columnist for "The Nation, The Forward, "and "The Daily Best, "he is senior fellow of the Center for American Progress, the Nation Institute, and the World Policy Institute. The author of eight previous books, including the national bestseller "What Liberal Media?, " Alterman is the winner of the George Orwell Award, the Jack London Literary Prize, and the Mirror Award for media criticism. A graduate of Cornell, Yale, and Stanford universities, he lives with his family in Manhattan. “So many books lately on the rise of the Right, but here, finally, is a history of postwar liberalism. Media critic, political columnist (e.g., The Nation), CUNY journalism professor, and best-selling author (e.g., Why We’re Liberal), Alterman joins with Ohio University professor Mattson to define liberalism through the individuals who have shaped it over the last decades. Important for current events readers except in really red states."